Kim Sharples was Batley's top goal scorer, despite missing her side's final game of the season against Cleckheation last Saturday when Rach Stewart scored a hat-trick. Batley Ladies rounded off their Yorkshire Hockey Association Division Four North campaign in style as they recorded a 4-0 derby victory over Cleckheaton at Heckmondwike Grammar School last Saturday. Cleckheaton arrived bottom of the table but knew victory, together with defeat for York Fifths, would see them avoid relegation. Batley immediately had the upper hand but although it was clear that Cleckheaton had some strong players through the middle, there was plenty of space out on the wings. Batley looked to take advantage of this playing the ball out wide and coming in hard on the attack and it wasn’t long before they started to create chances on goal. The break through came from a penalty corner as a scramble in front of goal saw the ball fall to Jo Forbes who cleanly put it in the back of the net. Cleckheaton had a strong chance to break down the middle of the pitch but Sarah Fretwell, Janna Macinnis and Sophie Pearce worked together to keep the strong visiting players marked closely, not allowing the defence to be broken down. Batley’s second goal came from another scramble in front of goal and was claimed by Rach Stewart, who was making a play for top scorer of the season going into the final match. Her mission to keep scoring continued when, from a great run down the right by Mel Neal, the cross was met by a diving strike from Stewart to find the back of the net as Batley went into half-time 3-0 up. Cleckheaton came back hard in the second half, wanting to take something from the match, but couldn’t get through the solid Batley defence. Loose balls were being picked up all over the pitch by Batley and quickly being played in to the Cleckheaton circle looking for more goals. Batley had a small period when Cleckheaton were down to 10 players as a defender was given a green card for questioning the umpire. Cleckheaton pulled together and kept the Batley attacks at bay while they were a defender down. Batley continued to create further chances and Stewart finally completed her hat-trick after they were awarded another penalty corner, crossed in by Gail Culshaw. 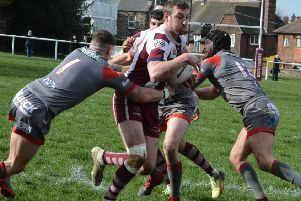 The game, and the season, ended with a win and Batley will continue to play in Division Four next season, although will miss their derby games against Cleckheaton. It was a great game for Batley to end the season on, with player of the match going to Stewart, whose hat-trick wasn’t quite enough make her top goal scorer, which went to Kim Sharples, who missed the final match.